January 4, 2017 - Cirrus Aircraft today announced the launch of the all new 2017 G6 – the smartest, safest and most advanced models ever of the best-selling SR22T, SR22 and SR20 piston airplanes. 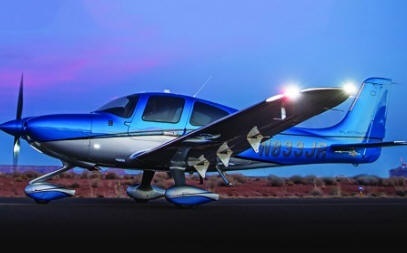 The benchmark for high-performance, single engine aircraft has been uniquely raised once again by Cirrus to include the just unveiled, ultra-high speed Cirrus Perspective+ by Garmin flight deck, luxury automotive-inspired Cirrus Spectra wingtip lighting, premium cockpit connectivity solutions and more. This sixth generation Cirrus is available for order immediately and customer deliveries are underway. “G6 is the result of the most innovative, capable and feature-rich set of upgrades we have ever applied to the entire SR product line,” said Todd Simmons, President, Customer Experience. “The word ‘comprehensive’ best describes the depth and breadth of all the improvements in G6 as the completely redesigned and fully-integrated user interface and lightning-quick speed of the brand new Cirrus Perspective+ flight deck is noticeable from the moment you power up. “The reality is the improvements in G6 taken altogether are a window into our design and development values at Cirrus Aircraft. While the new features brought by G6 are both innovative and compelling, they are equally intentional and customer-centric when it comes to real steps forward in capability, performance, style, and safety improvements. That bright light of innovation with purpose is our constant at Cirrus, and the enhancements we have made with G6 to the SR22T, SR22 and SR20 follow through on our commitment to leadership in Personal Aviation,” Simmons concluded. Cirrus Perspective+ by Garmin - At the core of the revolutionary G6 is the all new, next generation Cirrus Perspective+ (pronounced Perspective Plus) flight deck by Garmin. Inspired by Garmin’s latest G1000 NXi integrated platform, Perspective+ takes features Cirrus pilots have come to love and makes them even better. Ten (10x) times faster processing speed than prior Cirrus Perspective® avionics gives pilots enhanced performance and safety capabilities found in advanced turbine flight decks, such as animated datalink weather, SurfaceWatch™ safety protection, payload management, visual approach capabilities, wireless database uploads and more. The all-new keypad controller sports a Cirrus-first QWERTY interface, allowing you to make a seamless transition from your smartphone, tablet or laptop to your personal aircraft. And to make navigating the avionics and flight deck interface even easier, Perspective+ has an all new HOME key – instantly bringing you back to your main navigating functions with the touch of just one button. The new autopilot controller, which features the iconic Blue Level Button first brought to market by Cirrus, ties the piston and jet product lines together from the optional automatic Yaw Damper functionality to the same controller used on the revolutionary Vision Jet. Cirrus Spectra Wingtips - Taking cues from high performance luxury and exotic automobiles once again, Cirrus Aircraft has redefined and raised the definition of ‘ramp presence’ and lighting safety for personal aircraft. Working with Whelen Engineering, the global leader in emergency lighting and signaling solutions, Cirrus Aircraft developed the Cirrus Spectra wingtip. Incorporating ultra high performance LEDs behind one continuous lens, the dual-strobe Spectra wingtips combine power, style, and intelligence resulting in the brightest, most visible lighting solution ever offered by Cirrus. Brightness has increased two-fold for better visibility on landings, automotive-style wingtip halo lighting automatically operates within 300’ of the surface and on the ground making an iconic and bold statement, and pulsing “wig-wag” functionality above 300’ maximizes visibility to others giving the G6 an unmistakable presence anywhere in the world, day and night. All New G6 SR20 - The global standard in technologically-advanced, affordable high-performance piston training aircraft is all new for 2017 as well. In addition to the Cirrus Perspective+ flight deck, the aircraft now comes equipped with a modernized Lycoming IO-390, 215HP powerplant. This four-cylinder G6 SR20 creates a step change in the ownership experience as it increases power while, through a collection of additional enhancements, also increasing useful load by up to 150lbs (68kg). And now standard on every G6 SR20 are the new Cirrus-designed Spectra wingtips. For 2017, SR20 operators will now command the new global standard in flight decks, fly longer missions, potentially carry additional passengers and more. A Record Year - The launch of G6 continues a record year of enterprise growth at Cirrus Aircraft. In June, Cirrus opened a new Factory Service Center at the McGhee Tyson airport in Knoxville, TN at the home of the new Vision Center campus. In October 2016, Cirrus certified the world’s first single-engine Personal Jet – the Vision Jet – and began customer deliveries of the category-defining jet shortly after in December. Cirrus also expanded its manufacturing footprint in December by opening a new 68,000 sq. ft. Finishing Facility in Duluth to accelerate Vision Jet production.